Akim Aliu is certainly an interesting player under many points of view. Born in Nigeria and moved very young first to Ukraine, then to Canada, he had many controversial moments in his career. In the early years he had some kind of bad reputation that didn’t allow him to become a full-time NHL player, yet he still managed to play in many different high-level leagues and now moved to Russia to play for Amur Khabarovsk. Home of one of the two teams in the Russian Far East, Khabarovsk is a hockey town with a large population and excellent traditions in sports. Aliu is now playing his home games in the Platinum Arena, a 7,100-seats arena and traditionally one of the best attended “ice palaces” in Russia. After playing only 26 games in the 2014-15 season, in November Aliu decided to sign with Amur. 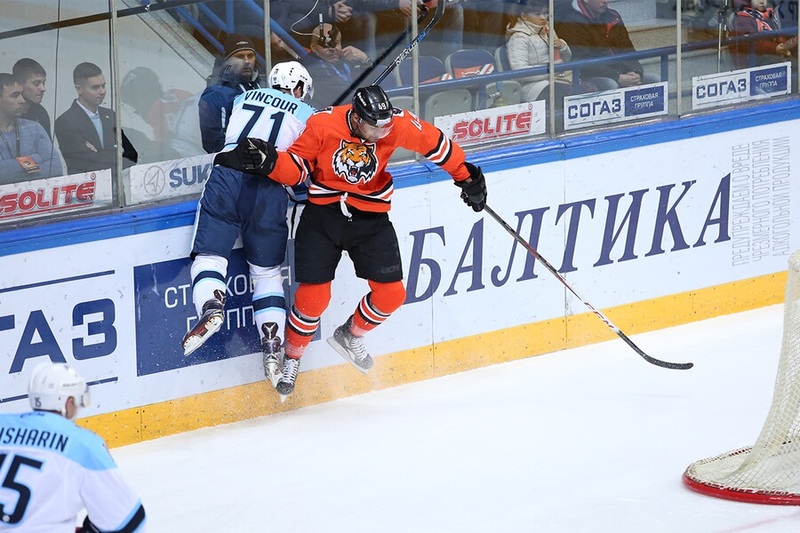 In this translated interview, originally appearing on the official Amur Khabarovsk blog on sports.ru, Akim Aliu talked about his first steps in hockey, his early life in Ukraine and Canada, and his family. * For the original sports.ru article, click here. – Do you remember the first pair of skates your father bought you? – Of course, I do remember them very well. I still have them, at home in Toronto. An old pair of Bauer, completely black. – You started skating when you were ten years old. It was quite late. How did you understand that you really wanted to play? – Everyone is playing hockey in Canada, all my classmates were playing, therefore I wanted to try myself. I was very young, I didn’t understand that everything was so expensive and a lot of money were needed. When we just moved to Canada we didn’t have a lot of money, but I wanted to play. – You got to Canada when you were nine and a half years old. Did you speak any English? – Not at all, I could speak in Russian only. It was very hard at first, but I learned fast and after a couple of months I could talk with all my friends already. – Did you attend a normal school? – Yes, that was just a normal Canadian school. – Do you remember your first day at school? – I don’t remember my exact very first day, but I do remember that period. It was generally hard for about one year and a half. But all the people around me tried to help me. Even in my first team I was admitted just because I wanted to play, while regularly you have to pay to practice with them. This helped me a lot and I quickly learned many things. After a bit it was pretty much clear that things were working. – What kind of job did your parents have at that time? – Everything was much harder for them. My father is a geologist, and my mother an accountant. But in Canada they could not work according to their specialty. My father was hired in a pizzeria, he had to cook pizzas and then serve clients too. It was a hard job. But my parents did everything they could so that my brother and I could have a good life, and I could play. – How old was your brother then? Was it harder for you? – Edward was fifteen. I don’t think that it was harder for him. I’m more closed, he’s more extrovert, he talks more. – What was your first team called? – Parkdale Flames. That was my district’s team. – Later you played for the Calgary Flames. – Yeah, I thought about it too. Life’s irony. – You played a good number of games in the KHL already. What are your impressions about the league? – Here hockey is much different from North America. But the level of play is very high. In the OHL there are some teams who play big ice hockey. I also played in Sweden. I had some experience of playing on the big ice. – Were you worried before your first KHL game? – Frankly speaking, I never worry before games. – Everyone knows that you are an aggressive player. Many people were awaiting from you some nasty plays, maybe even fights. – I simply try to play my game. I consider myself as a clean player. Yes, I try playing an aggressive style, but my goal isn’t fighting. However, if I don’t like something, I make sure the opposition understands it. – In the book “Future Greats and Heartbreaks” there is a chapter about you. There it’s easy to understand that you don’t like when people acts unfairly. – I didn’t read that book. But I can say that I don’t like when the opposition plays dirty or they attack a player knowing that he won’t reply. This makes me crazy. – You got acquainted with the team quite fast. What helped you? – Russian language. In Toronto there is a big Russian diaspora. My parents have many Russian friends. Here I can understand the other players, and the coaches can understand me. Of course I don’t understand everything when they talk very fast, though. But I was met in the team very warmly, and the guys help me a lot. Amur is a good team and I’m glad to be playing here. – What players helped you in growing as a player? – I had the luck to play with many guys who now play in the NHL. I played with John Tavares for the Toronto Marlboros and the Milton Icehawks. I was very young when I was put in the same line with Jarome Iginla and Mike Cammalleri. I watched at them trying to learn as much as possible. But not only from them, also from all my other teammates. But I can’t say that I wanted to be like them. I always wanted to be myself and play the way I could do my best for the team. – What music do you like to listen to? – I listen to a lot of hip-hop and rap, or R&B. Drake, Weeknd, Future. – You have many tattoos. Do they have a meaning? – All my tattoos are related to my family. The name of my parents, Edward, my brother, my grandpa, his name is Mikhaylo Khrebet, he’s 83, but we’re very close. I asked them to write their names by hand, then the tattooist replicated them. I also have an angel, for my uncle, which unfortunately passed away. I also have a couple of written words, Faith and Family. I also have some phrases from the Bible, “Be joyful in hope, patient in affliction, faithful in prayer”. And also “It came to pass”. – It looks like you really care about your family. – Yes, I always think about them. I always have four sticks, and I need to get a wooden insert because I’m tall. On them I always write “Pa”, “Ma”, “Ed,” and “Ded”. [Note: Ded is short for grandpa in Russian.] If I play well, I save those sticks for the next game. If one stick breaks, I remove all the inserts and I get new ones. This is my ritual. – You have a nickname, “Dreamer”. Where did it come from? – I was called that way first in junior hockey. There was a basketball player called Hakeem Olajuwon. He’s a legend. And he was born in Nigeria, like me. His nickname was “Hakeem the Dream”, so my teammates started calling me “Akim the Dream”. Once our equipment manager had to order sticks for our team. I was about fifteen or sixteen years old. My stick had a label with “Dreamer” written on it. I liked it and I didn’t want to change it.